Nigeria goment don tok say lai-lai e no dey possible say Abba Kyari go collect money to award contract give pesin. Goment say di chief of staff to President Muhammadu Buhari no do any secret meeting wit anybody. Garba Shehu, wey dey rep di presido for media mata, say e no true say oga Kyari collect N29million bribe to award contract. E tok say di accuse sef get as e be because "make we dey blunt, e dey difficult to make case of N29 million bribery against official wey reject monthly payment of N200 million to im office, money wey be say e no need to account to anyone." 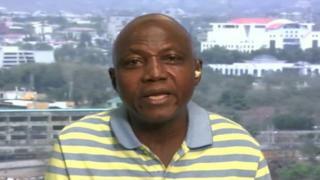 Mr Garba say di Presidency dey vex seriously for wetin Punch Newspaper publish on Saturday . "We wish to tok here wit full authority say di accuse dey wrong and di Chief of Staff no get any private meetings wit di pesin wey dey make dis accuse." Oga Garba say wetin even surprise dem pass na di decision of Punch to still publish dis kain lie-lie tori upon say di Bureau of Public Procurement deny say di pesin wey be di source of di story no be dia staff. Tori say during one radio programme for Berekete Family Radio 101.1FM, Abuja, one pesin Bako Kyari, wey claim say im na nephew to di chief of staff accuse Abba Kyari and one Sani Ado, wey e claim say dey work wit Bureau of Public Procurement (BPP), say two of dem collect N29.9 million from am so dat dem go give am contract. To clear di mata wey dey ground, Mr Garba say di contract to supply 15 Hilux vehicles for di Presidency, no dey possible because e no even exist for anywhere inside di 2016 and 2017 budgets. "If you check di appropriation for 2016 and 2017, dat request no even dey dia. How Abba Kyari go ask for money to award contract wey no even exist anywhere at all?" E add say make Punch newspaper prepare to face Abba Kyari inside court.